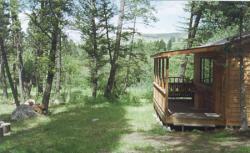 Boulder Creek Cabins & RV Park is located at the edge of the Pintler Mountains, near historic Philipsburg, Montana. We are family oriented and we especially like to cater to family reunions. We have a beautiful lodge with a large stone fireplace. We have fine dining in the lodge on weekends and can also cater an event to meet your needs. Downstairs in the lodge is our bar and lounge area, game room, and large men and women's restrooms with showers. Just outside to the rear of the loge is the hot tub room. A few steps away, nestled in the pines are our cabins, complete with queen size log beds, linens, TV/VCR and unlimited free movies. We also have an enclosed picnic shelter, a volleyball court, horseshoe pits, a playground, a stage for special events, a wedding chapel, a bath house with laundry facilities an a full service RV Park. Last but not least, we have 900' of Boulder Creek frontage. Things to do in the area: Nearby Philipsburg has the renowned Sapphire Gallery and the Sweet Palace. There are over 30 mountain lakes and 2 blue ribbon trout streams nearby (a hiker's paradise). You can hunt sapphires at Gem Mountain 25 minutes away. Jack Nicholas Golf Course in Anaconda 45 minutes away. Both National Parks, Glacier Park and Yellowstone Park are just about 4 hours away. Several ghost towns in the area. Butte, Helena and Missoula are all just an hour away. Hundreds of miles of pristine snowmobile or ATV trails on public lands. Ski beautiful Discovery Basin just 30 minutes away. Directions: Boulder Creek Cabins & RV Park is located on the Pintler Scenic Highway 1. 17 miles south of Drummond at the 47 mile marker. Drummond is 47 miles east of Missoula on I-90. We are 11 miles north of historic Philipsburg. Both Glacier and Yellowstone Parks are just 4 hours away.